Bunaken is one of the stunning beauty of the sea in Indonesia. You can swim with the fishes and the sea meet the colorful coral reefs, a cool place to Diving. Not only a favorite place for tourists in the country, the charm of Bunaken are makes fall in love international tourists. Located in North Sulawesi and not far from downtown, Manado. 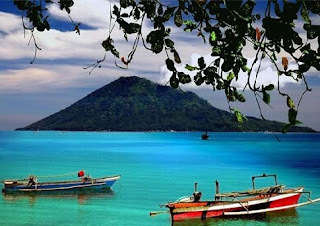 Bunaken in Manado Bay with an area of ​​8.08 km2. You can take it with a speed boat from Manado at a cost of Rp 25,000 per person for 40 minutes. Bunaken marine life was colorful. Marine park as a giant aquarium that pamper you. Not surprisingly, this place has always been a destination for divers. 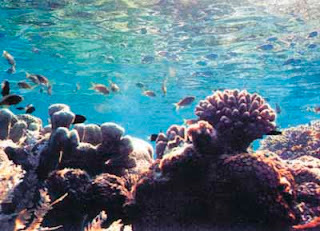 there are 13 types of coral reefs in Bunaken marine park is dominated by marine rocks. One of the interesting sights, the coral cliffs that rise vertically downwards as deep as 25-50 meters. Not only are coral reefs, there are 91 species of fish that are ready to accompany you. The types of fish such as local fish gusimi horse (Hippocampus), white koi (Seriola rivoliana), lolosi yellow tail (Lutjanus kasmira), goropa (spilotocepsep hinephelus and hypselosoma Pseudanthias), indigo trunk (Scolopsis bilineatus), and others. In Bunaken also has a 20 point dive. Sure, the underwater biota at any point of diving is different and beautiful. Do not forget to visit the Manado Tua, Siladen, and Mantehage, which has a beach that is no less beautiful. You will spoil by the beauty of Bunaken. Take dive Bunaken, met with the fish, and taste the charm of coral reefs.